We are located in a green and beige five-story office building next to the Holiday Inn in Oakville. Our office is on the ground floor, on your right side just as you enter the parking lot. ​There is plenty of free parking available in front of the office and in the back of the building. 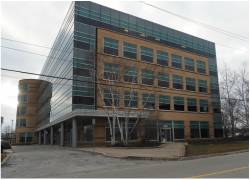 The office is located a short walk from the Oakville GO station and along major Oakville Transit bus routes. Please feel free to contact us at the office or through this form for more information or to provide feedback.